Do you live in a retirement home or sheltered housing? Do you have a social club with members who are itching to get moving? If the answer’s yes why not set up one of The Right Step’s Social Dance Companies? It’s a great chance to get to know eachother, keep fit and, if your group wants to, perform. Here’s an example of a group we already have. Run for the social club at Foord Almshouses this was The Right Step’s first older adult dance company. It’s an all women’s group who meet once a week. The Foord Fillies do dance and aerobics style classes developed just for them. 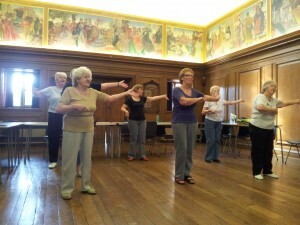 The class started because the women living at Foord Almshouses wanted to keep fit and didn’t want to travel to do it. They also needed something inclusive that would include standing and seated as the residents are all very different. The classes now contain opportunities to dance seated or standing with routines to learn and copy. It’s always developing and The Foord Fillies are now thinking about doing a performance! Photo: Some of The Foord Fillies at The Right Step’s Third Anniversary Party. Photo courtesy of Nikki Price Photography. Please email or phone us for more information about joining one of our current classes or starting one of your own.